Seed treatments are applied to soybean (Glycine max L. Merrill) seeds to control early season diseases and insects. Unsold, treated soybean seed must be disposed in a different manner than untreated seed. To minimize treated seed disposal costs, it is necessary to improve seed storage. 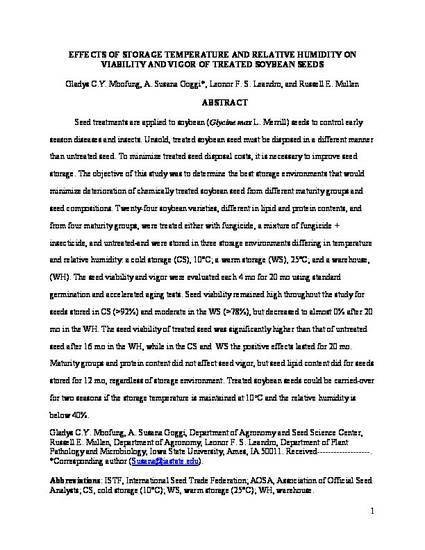 The objective of this study was to determine the best storage environments that would minimize deterioration of chemically treated soybean seed from different maturity groups and seed compositions. Twenty-four soybean varieties, different in lipid and protein contents, and from four maturity groups, were treated either with fungicide, a mixture of fungicide + insecticide, and untreated and were stored in three storage environments differing in temperature and relative humidity: a cold storage (CS), 10°C; a warm storage (WS), 25°C; and a warehouse, (WH). The seed viability and vigor were evaluated each 4 mo for 20 mo using standard germination and accelerated aging tests. Seed viability remained high throughout the study for seeds stored in CS (>92%) and moderate in the WS (>78%), but decreased to almost 0% after 20 mo in the WH. The seed viability of treated seed was significantly higher than that of untreated seed after 16 mo in the WH, while in the CS and WS the positive effects lasted for 20 mo. Maturity groups and protein content did not affect seed vigor, but seed lipid content did for seeds stored for 12 mo, regardless of storage environment. Treated soybean seeds could be carried over for two seasons if the storage temperature is maintained at 10oC and the relative humidity is below 40%. This is a manucript of an article published as Mbofung, Gladys CY, A. Susana Goggi, Leonor FS Leandro, and Russell E. Mullen. "Effects of storage temperature and relative humidity on viability and vigor of treated soybean seeds." Crop Science 53, no. 3 (2013): 1086-1095. doi: 10.2135/cropsci2012.09.0530. Posted with permission.